This combination will nourish your dry and dull skin; it will also remove dead skin cells. Besan (gram flour) acts as a cleanser and curd has a moisturizing properties. Take 1 tablespoon curd, 2 tablespoons besan, pinch of turmeric and 1 tablespoon honey. You can add enough water or rose water to make paste smooth. Mix all these ingredients thoroughly to make smooth paste. Apply the paste on face and neck area. Wash it off with normal water after 20 minutes. Follow this method 2-3 times a week. This face mask is a great solution for blackheads on face especially on the nose. It also helps in shrinking large pores and pulling out unnecessary oil from skin. Blend handful of fresh coriander leaves to make fine paste and add 2 pinches of turmeric powder. Mix it well, apply on your face and leave it overnight. Wash it off with normal water. Do this 2-3 times a week to get rid of blackheads easily. Multani mitti (fuller's earth) has great healing properties against acne and blemishes. It lightens acne scars, dark spots and cleanses the skin, as it is rich in magnesium chloride. Mix two teaspoons of multani mitti with 1 tablespoon fresh lemon juice and pinch of turmeric. You can add enough water or rose water to make paste smooth. Apply this paste on face and keep it until it dries off. Wash off with normal water. Fenugreek (methi) has cooling properties and cures inflammation and discomfort caused by acne and pimples. It also keeps our skin hydrated and clean. Boil 2 tablespoon methi seeds in one and half cup of water until seeds become softer. Strain the water and allow it to cool down. Apply this water over the skin with help of cotton ball. Rinse off after 60-70 minutes. It gives immediate cooling effect and reduces redness. 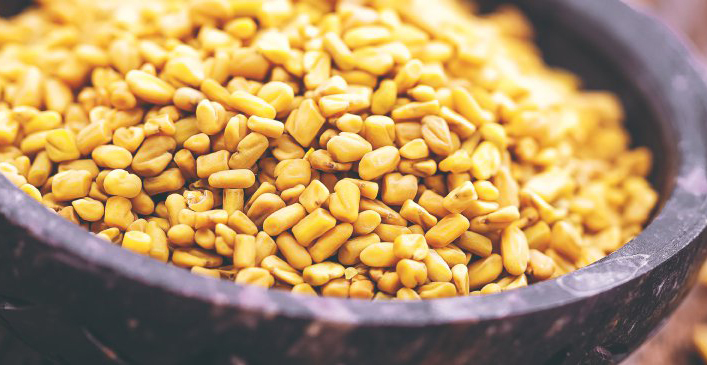 Soak 2-3 teaspoons of Fenugreek seeds overnight and grind them using enough water to make smooth paste. Apply the paste over face and wash off after 20 minutes. Lemon works as cleansing agent, it eliminates dead skin cells and reduces oil secretion. On the other hand honey works as a great moisturizer. Mix half tablespoon of fresh lemon juice with 1 teaspoon of honey. Apply this mixture on your face and let it dry. Rinse off with normal water. Mix 1 tablespoon aloe gel with 1 teaspoon of fresh lemon juice and few drops of rose water. Mix all the ingredients well. Apply this mixture on face using brush or fingers. Leave it for 20 minutes and wash off with normal water.